Deep-dive career narratives focused on impact, value, and professional branding. Our bespoke résumé writing projects can take many hours of work and are performed at individualized project-based rates. Be forewarned: there’s usually at least a two-week wait to start bespoke projects because our founding principal, Shauna C. Bryce, personally interviews, writes for, and works with each and every bespoke client. She does not use subcontractors for any part of your bespoke process. 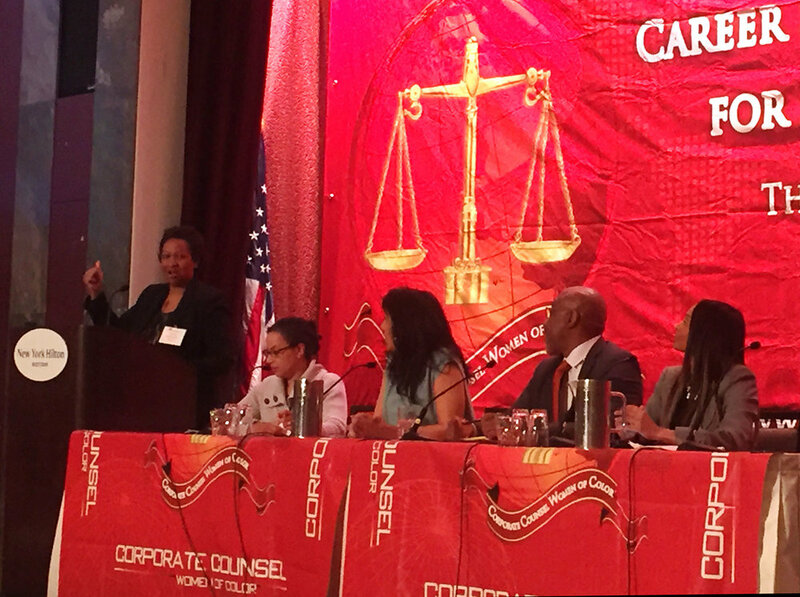 Shauna C. Bryce as moderator of “5 Creative Strategies for Career Development: You Don’t Have to Play Golf to Get Ahead,” Corporate Counsel Women of Color (CCWC) One-Day Career Strategies Conference, hosted by K&L Gates LLP in New York, NY. Introduced by CCWC CEO Laurie Haden Robinson of CBS. With panelists Tatia Williams of the NBA, Eric Cottel of K&L Gates, and Sabrina Hannam. You’ll be asked to provide sample job ads so that we know your ideal type of employer, industry, and roles. Shauna’s aim is to create a résumé targeted toward those ideals. She calls it a "master résumé" because—even though it’s already targeted toward your general goal—you'll still want to make tweak the résumé before you send it out for specific opportunities. We'll discuss how to do this during the Follow Up process (see below). The bespoke writing process can used for many types of documents in addition to résumés, including business plans, 30-60-90 plans, and website copy. However, most clients use the bespoke process for a combination of master résumé, master cover letter, and LinkedIn profile optimization. All services and consultations are provided remotely, allowing Shauna to work easily with clients around the country and the world. Again, bespoke résumé writing is a multi-step, deep dive process. Typically, you should plan for about 30 to 45 days from Client Interview to completed documents. If you cannot wait, then please consider On-Demand Writing instead. You’ll start with a complimentary 15-min introductory call with our founding principal, Shauna C. Bryce. In that call, you’ll discuss your goals, needs, timing, and pricing, as well as get an overview of how it all works so that you can decide whether our bespoke track is a good fit for your needs. Your individual pricing will depend upon a variety of factors relating to the complexity of your project. Different industries and types of employers have different needs and different expectations. Résumés work best when they are developed with a particular audience (or set of similarly-situated audiences) in mind. That pre-supposes clients have a fairly firm idea of the types of employers and positions they want to pursue. If you’re not yet at that stage, then we recommend starting with career coaching to discuss career planning and decision-making prior to investing in the bespoke process. Should you decide not to proceed further on the bespoke track, we also welcome you to consider the on-demand writing track or work-on-your-own options. After initial payment is received, you’ll receive details on background information to gather and send Shauna prior to your interview, as well as questions to think about to help you prepare. Your final payment will be due, along with your information gathering, 48 hours before your interview. Your interview will be an in-depth writing and strategy call that’s also great preparation for taking about your work in other settings—including job interviews. As they partner with Shauna to answer the fundamental question of “Why should an employer hire you, rather than someone else?,” many lawyers find they are challenged to think about their career narratives, contributions, impact, and value in ways they had not previously considered. Together, we will consider more than just your technical skillset; we’ll also discuss what types of problems you solve best, for whom, and in what types of environments. These questions help increase the likelihood of finding a good fit between you and prospective employers so that you can focus your job search better and waste less time fielding off-target inquiries. Occasionally, the client interview process will reveal a technical skills, experiential, or other gap between clients and their targeted roles. Alternatively, the process may reveal other potential roles that might be good career options. Shauna generally spends between 90-mins and four hours with clients during the interview stage. Your individual client interview process will be explained in your proposal. It usually takes about 10 business days after your client interview for Shauna to plan, design, and write your legal résumé. During that time, she may ask for additional information. Shauna is very aware of the conservative aesthetics of the legal sector, and strives for a balance she calls “modern classic.” You will not get a résumé filled with hyperbole, empty résumé-speak, legalese, or formats and graphics better suited for other professions. Shauna focuses on providing fact-based and evidence-based documents that clearly reflect individual career journeys, experience, and value—all in proven design formats that meet the traditional expectations of the legal sector while simultaneously feeling fresh. Such documents offer visible reinforcement of your professionalism and balanced judgment. When your draft document is ready, she’ll email it to you as a Microsoft Word .doc or .docx, as well as a .pdf for comparison. Again, your résumé will be a master résumé. By definition, it may need to be adjusted to mirror the needs specific employers and opportunities as you launch your job search. Shauna provides a post-project tip sheet to help you do this and you’ll have an opportunity to discuss this in your Follow Up. Many clients don’t request significant changes, but even so you’ll have a follow up call along with an opportunity for editing or simply to ask questions about launching your job search. As a lawyer and former hiring attorney, Shauna appreciates the importance of precision in language. This is your career and reputation at stake, so now is the time to nitpick shamelessly! Be mindful that—in addition to presenting you as a desirable candidate to your target audience—your résumé must pass background and reference checks, both formal and informal. Shauna encourages all clients to read their career documents critically to ensure they are 100% accurate. You must be comfortable discussing and defending every word, phrase, and sentence on your résumé in a job interview or other setting. In many cases, the review, editing, and follow up process is completed in a few days to a week. Shauna typically spends around 30-mins to 60-mins with clients in the follow up call, and you’ll have the opportunity for about two rounds of edits. Your follow up process will be stated in the proposal. Consultation and edits beyond what’s included in your project proposal are available at an hourly rate. And because our collaboration works best when there is momentum and continuity of thought, changes requested after 30 days from initial document delivery may be subject to additional charge. Please review our Terms & Conditions for more information. LinkedIn profile optimization, résumé addenda, deal sheets, representative matters, cover letters, or other documents are, of course, available. When they are purchased at the same time as the résumé, Shauna can structure the combined project more efficiently than if they were purchased and developed as separate projects. She passes the resulting savings to you in the form of efficiency pricing. If you’re considering a suite of documents in addition to your résumé, please let Shauna know at the time of your 15-min orientation call or sometime during your bespoke process in order to receive efficiency pricing. For Fortune 500 CLOs, GCs, C-Suite lawyers, and law firm equity partners, the typical price range for a master résumé (often four to six pages) with LinkedIn Profile Optimization, is $2,700 to $3,700. These projects can take more than 20 hours of consultation and writing. Your project pricing can be adjusted to include résumé addenda, leadership bios, marketing materials, and correspondence. For executive lawyers, non-equity law firm partners, and on-track lawyers, the typical price range for a package of master résumé, master cover letter, and LinkedIn profile optimization is $3,500 to $4,500. These résumés are usually two to three pages and often incorporate a mini-deal sheet, sample projects, and representative matters. These projects generally take up to 15 hours of consultation and writing. For subject matter experts, senior, and midlevel attorneys, a suite of bespoke career portfolio for senior and midlevel attorneys—consisting of a master résumé, master cover letter, and LinkedIn profile optimization—generally involves two to four hours of consultation, and up to 10 hours to plan, design, write, and edit. The typical price range is $2,200 to $3,200. However, we find most of these lawyers well served by our on-demand writing process rather than bespoke writing and don't require the additional investment of resources inherent in bespoke writing. For junior lawyers, new attorney, and law school students, we recommend our on-demand process rather than bespoke writing. For prospective law students, we may recommend our on-demand process or refer you to a specialist in law school admissions and applications. Please contact us so we can develop a plan that works best for you. For lawyers leaving the law, we need to know more about your particular situation. In some cases, those résumés are well within Shauna’s wheelhouse. Other times, she’ll refer you out to another trusted professional résumé writer who is a better fit to help you target your new industry and market. For non-attorney legal professionals, we will refer you out to other trusted professional résumé writers. To get started on the bespoke writing track—or for a referral—please contact us. Why work with Bryce Legal? How can you choose the best lawyer career coach and legal résumé writer for you? Here’s what just a few our clients say. To read hundreds of client reviews and testimonials from attorneys, please see Our Client Testimonials. Need a Legal Résumé or CV Written by a Top Expert in Legal Careers? Why Choose Bespoke Résumé Writing by an Expert in Professional Branding for Lawyers? How Much Do Professionally Written Résumés for Lawyers Cost?